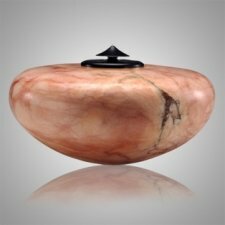 The White & Pink Alabaster Cremation Urn (a very exclusive and rare stone) is hand turned on a lathe from finest white & pink alabaster and African wonder stone rim and bronze threaded lid. The urn is crafted from a 40 - 60 pound solid piece of alabaster and requires an average of 25 - 40 hours to turn, shape, sand, buff and finish. Due to the nature of alabaster, patterns and colors will vary.